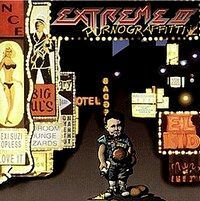 Extreme are known by many rock fans for More Than Words, but back when Pornograffitti came out their video for Get The Funk Out and Decadence Dance was on heavy rotation on MTV. The band of singer Gary Cherone was showing hard rock combined with other elements - like funk. They were the forerunners, they made the people open up for something new. Since they returned in 2006 they only delivered Saudades de Rock in 2008, but played a lot live. At one of these tour this album was recorded which kicks off with Decadence Dance. Next the Bostonians offer Comfortably Dumb from their last studio album and they show that the new songs work well combined with their old ones, their classics. Even if It('s A Monster) sounds not as vivid as it did back in the days... With 5 albums they have enough songs to choose from and as they were out to promote Saudades de Rock they have added some classics. The double CD offers 16 songs and a medley of Kid Ego, Little Girls and Teacher's Pet. The 2nd CD opens up with their biggest hit - More Than Words. And as expected the audience sang along loudly - partly you hear just Nuno Bettencourt's acoustic guitar and the fans. Very cool. And they head into Ghost with a keyboard intro, the song is taken off their 2008 release. 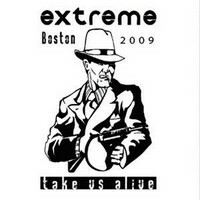 The show included songs from all their albums and so it's a great way to get the best of Extreme at once. Actually Ghost is one of the highlights for me. With Cupid's Dead they return to their funk metal roots. Flight Of The Wounded Bumble Bee is only an interlude and leads you into Get The Funk Out. After Am I Ever Gonna Change (No?) they close this chapter with Hole Hearted, another hit of the Bostonians. The concert was also recorded for a DVD, so you can watch the Beantown boys rocking the stage in their home town! Actually I heard this band first on MTV when one morning I saw Get The Funk Out. But the album starts with thunder - with Decadence Dance. The Americans offer hard rock / melodic metal with some funk elements and this makes their sound unique. Well, actually Dan Reed Network did that before, but it seems it was too early for the majority of the people. With producer Michael Wagner they had a real big name on board, he gave them a big sound. The guitars screaming while bass and drums give it the punch. The catchy hooklines make it perfect for MTV and so it's no surprise that they got into heavy rotation with their first single Get The Funk Out. The funky groove is a constant element on Pornograffitti. In Lil Jack Horny they use again a brass section and with adding this unusual elements they stand out between all the glam rock / hair metal band of these days. When I'm President they sound a bit like Run DMC when the song starts... And they keep this sound. Okay, nothing new, but well done here. After the single release Get The Funk Out the band comes along acoustically with More Then Words. Acoustic guitar and the voices of Gary Cherone and Nuno Bettencourt - that's all. Reduced to the minimum - and it don't need more. This is better then some bombastic ballad. Soon this will be on every rock ballad sampler! More funky rockers follow. At the moment this sound is appreciated, but will it last? Time will tell, but at the moment this funky rock is enjoyable.With When I First Kissed You and Hole Hearted they present some more ballads, these are produced by guitarist Nuno Bettencourt. Sinatra-like is When I First Kissed You. A bit heavier, but still... It sounds like Pat Badger is playing double-bass. It swings. In my opinion He Man Woman Hater is not fitting in this album... Well, it would fit in when they have started right away with the song, but this guitar piece in the beginning I find very annoying. As it's a CD, I can skip it. Or join in later. Lyrically they critcize the Americans a bit with songs like When I'm President, Pornograffitti and Money (In God We Trust). On this album the talent of guitarist Nuno Bettencourt is more obvious then on the predecessor - which I listened to meanwhile - and it also shows that a good producer can bring the best out of a band. But they sound unique, if this enough for a lasting career... We'll see.